QST what are they? » What's Under the Needle? home » 30 day challenge » QST what are they? A QST is a square that is cut through the diagonal twice to give four triangles. The long edge of all triangles is on the straight of grain. The short edges are on the bias. All four triangles are the same. Four QSTs make a square. Why do we use QST? 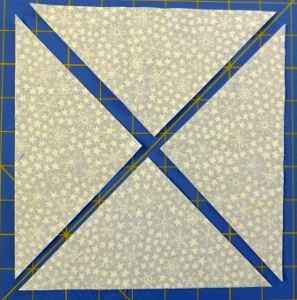 QSTs are used where the long edge of the triangle is toward the outside of the block or quilt. By ensuring this edge is cut on the straight of grain prevents stretching around the edge of the block or quilt. After cutting up some of these triangles today to use in my quilt, I thought I'd better check my free lesson on how to make a QST block and decided that I should update it. Check it out. Quarter Square Triangle Blocks Free lesson.